Stars like our sun may be the most likely to harbor intelligent life in the galaxy. When scientists search the heavens for habitable worldsbeyond Earth, they don't necessarily know what to look for. A new study has foundthat the most probable place to find intelligent life in the galaxy is aroundstars with roughly the mass of the sun, and surface temperatures between 5,300and 6,000 Kelvin (9,100 and 10,300 degrees Fahrenheit) - in fact, stars verysimilar to our own sun.?? Learning that sun-like stars are goodcandidates for life may not sound surprising, but it isn't always whatscientists have thought. "The principle of mediocrity says that, barring anyevidence to the contrary, our observations should be typical among those of allintelligent observers,? said researcher DanielWhitmire, a physicist at the University of Louisiana at Lafayette. "Butthe typical star is not like the sun - the typical star is a low mass star. Wedon?t find ourselves around a typical star and we show the reason why in thispaper. Our results confirm the principle of mediocrity as applied to the sun." Sun-like stars are actuallya minority in the galaxy - 93 percent of stars in the Milky Way are lessmassive, less luminous and cooler than the sun. Though the typical star in thegalaxy weighs between one-tenth and half the mass of the sun, life is morelikely to be found around the more unusual variety of stars like our own, theresearchers found. To make their calculation, Whitmire and colleague JohnMatese combined models of how planets form with data on the distribution ofstars in the galaxy as a function of mass. The planet models show when worldsare most likely to form in the habitablezone - a Goldilocks region around a star in which a planet would be justright for life - not too close that its surface would be boiling, and not toofar that it would be frigid either. Planets in the habitable zone are the bestcandidates for having liquid water, which is thought to be a prerequisite oflife. In general, the planet-formation theories predict that moremassive stars are the most likely to have planets in the habitable zone. So thelarger a parent star is, the more likely its planets will have environments conduciveto life. But this advantage of larger stars is counteracted by thefact that more massive stars are less abundant - there are fewer big stars outthere. In addition, the more massive a star is, the shorter its lifetime. Thatmakes it hard to find very massive stars that have lived long enough forcomplex life to develop. The researchers weighed these factors against each other to calculatethe distribution of stars most likely to host thinking, living creatures. "It'sa tradeoff between the numbers of stars out there and the probability ofhabitable planet formation increasing with mass." Whitmire said. "Weshow it's no accident we find ourselves around a star like the sun." The distinctionbetween habitable planets and planets harboring intelligent life is based onthe fact that intelligent life requires stars with lifetimes greater than thetime required for intelligence to evolve. For example, in the case of thissolar system, we could not find ourselves around a star with a lifetime lessthan 4.5 billion years. Indeed, sun-like stars seem to have the right balance: Theyare of high enough mass that they are more likely to host habitable planets,but they are of low enough mass that they live long enough for intelligent lifeto develop, and are not extremely scarce. Whitmire estimates that 10 percent ofthe Milky Way's stars might fall into the category they've outlined. This would still leave over 10 billion candidatestars in the Milky Way alone. The results mitigate the most commonly used argument thatintelligent life must be extremelyrare, Whitmire said. This idea, based on the anthropic principle, wasoutlined by astrophysicist Brandon Carter. There is an approximatecoincidence between the time it took intelligence to evolve on Earth and thelifetime of the sun. Assuming these two timescales are independent, thiscoincidence makes sense if intelligent life is extremely improbable,Carter argued. In most cases, he claimed, the time it takes for intelligentlife to emerge is much longer than the portion of a star's existence that isconducive to such life. "In the paper we explain one number in the coincidence? 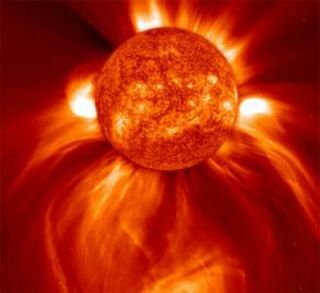 why the lifetime of the sun is what it is," Whitmire said. "The additionalassumption necessary to counter the Carter argument is that intelligent life requiresat least a few billion years to evolve, as expected if we are typical." The study is detailed in the September 2009 issue of the AstrobiologyJournal.